For most people, work is a necessity. While there are a few of the “live to work” types out there, a job is a means to an end for the vast majority of the population. It doesn’t mean most people hate their jobs or don’t find meaning from working, it just means they probably wouldn’t be sitting at their desk if they weren’t being compensated for doing so. It also means that, when the opportunity arises, they’ll take another job if more compensation is offered. To that extent, we’re all paid mercenaries. Like it or not, a valuable compensation plan is necessary to reap the benefits of employee retention - which as we’ve learned, is an important aspect of customer retention. As we’ve outlined in “What Millennials Want (In the Workplace)”, wanting to be paid lots of money isn’t exclusive to any generation. Millennials, more than maybe any other generation, see “compensation” as more than just salary, and they’re aware that it includes a laundry list of other aspects including benefits, perks, and freedoms (such as flexible working arrangements). 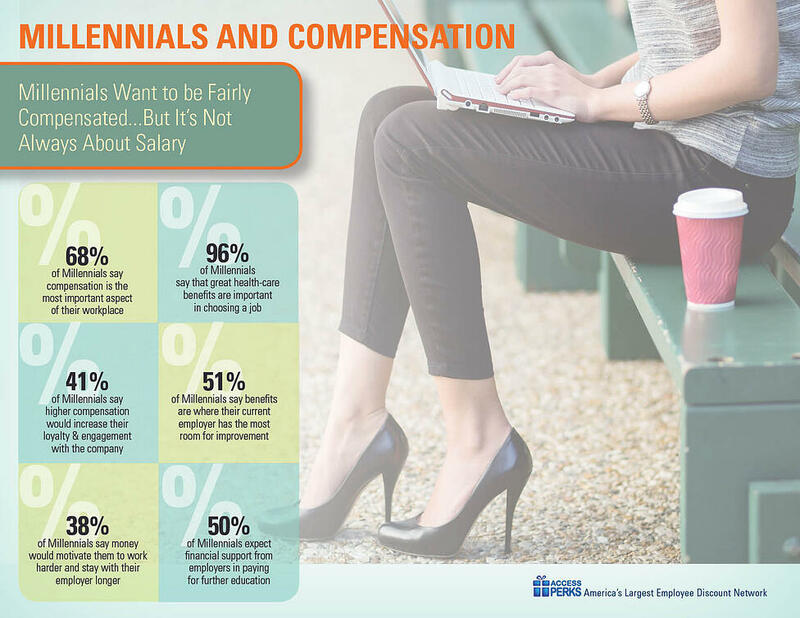 As this infographic shows, money is important to Millennials, but so are other forms of compensation. Studies show that benefits play a major role in job selection, and companies that lag in benefits tend to also lag in engagement and retention. It’s important to also point out that “benefits” extends well beyond health care. Education reimbursement offers a huge opportunity to appeal to this generation, as more jobs than ever require degrees, and the average Millennial graduate is already toting around $24k in debt. The bottom line is Millennials allow companies to get creative with compensation. Dollars and cents still matter to everyone, but the bigger picture is addressing needs and burdens. Benefits and corporate perks can add a ton of value without bring forth a ton of cost. Yes, studies have shown an idealistic streak in Millennials. They’re willing to take less money to have a cool job, or work for a company that supports good causes. Don’t be naive though, they have serious financial needs that they’ll pursue, and employers can earn their loyalty by helping address those. Benefits play a big role in reducing mercenary culture, but they need to actually meet up with what employees need. Death and dismemberment coverage, to name an example, isn't going to move the dial for most employees. Shape your benefits to your employees' needs, then devote resources to encouraging usage. It'll pay off in recruiting, as well as more steady, normal salary costs.